1 cup White SugarHalf a cup is used for the dough, and half for the lemon curd. ½ dash SaltThis is for the cookie dough. The lemon curd needs a pinch as well. 1 Have on hand a 2 1/2 to 3" round cookie cutter and a 2" star cookie cutter. 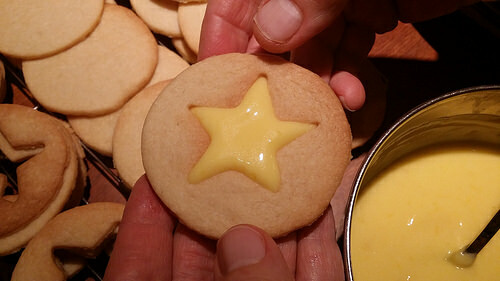 The idea is to have a star cookie cutter just a little smaller than the round one. 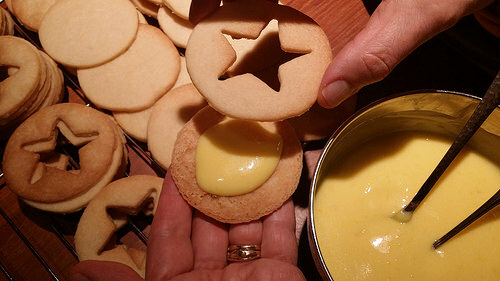 Then you cut out the same number of plain rounds as rounds with star cutouts in the center, in order to make sandwich cookies with a plain round on the bottom, lemon curd in between, and the star cut-out round on top so you see the lemon curd filling in the shape of a star. 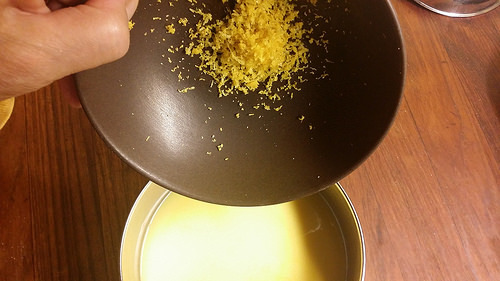 2 In a good-sized mixing bowl, cream together the butter and sugar, adding the sugar gradually and beating well so that the mixture becomes light and soft. 3 Add the egg whites gradually until well-blended. Add the vanilla. 4 Mix the flour and 1/2 teaspoon of salt together, and add this mixture, one cup at a time to the creamed mixture. 5 Turn the dough onto the counter and knead it briefly with a little added flour on the counter if needed. 6 Shape the dough into two round flat cakes, wrap them in plastic wrap and refrigerate for at least an hour, and up to a few days. 8 Nearby the stove, place a small bowl with a strainer over it. 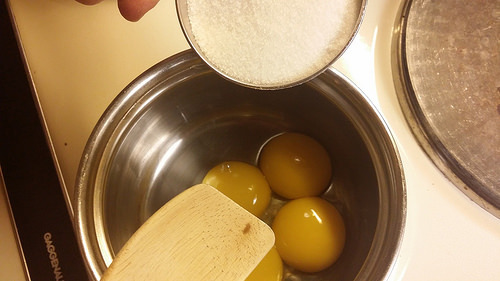 9 In a small, heavy saucepan, mix well together the yolks and sugar with a wooden spoon. Stir in the lemon juice, 4 tablespoons of butter, and a dash of salt. 10 Cook over a fairly low heat, stirring constantly, until somewhat thickened. This takes about six minutes or so. The mixture should just barely coat the back of the wooden spoon when it is lifted out of the mixture. If the mixture begins to steam, take it off the heat and continue to stir. It needs to cook gently so the yolk doesn't overcook and become curdled but rather is well incorporated into the mixture so that the mixture thickens evenly. It should look something like a Hollandaise sauce. Also, the color will change slightly to become less translucent and more yellow. 11 Immediately, pour the mixture into the strainer so that any residue is left behind, pressing the strainer gently with the back of the wooden spoon. 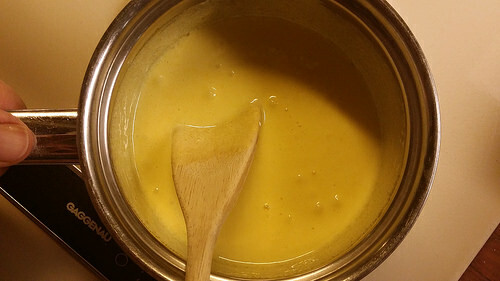 12 Add the lemon zest to the strained sauce which, when cooled will be your lemon curd. 13 Preheat the oven to 350 degrees. 14 Prepare two cookie sheets by greasing lightly with butter or, alternately line the sheets with parchment paper. 15 On a lightly floured board, roll out the dough to about one eighth in thickness. 16 Cut out an equal number of rounds and rounds with star shapes cut out of the middle. 17 Place the shapes on cookie sheets and bake for about 9 minutes or so, just until they are lightly browned on the edges. 18 Let the cookies cool on racks.When cool, place lemon curd on the plain rounds, and cover with the star cut-out rounds. There you have your star cookies. 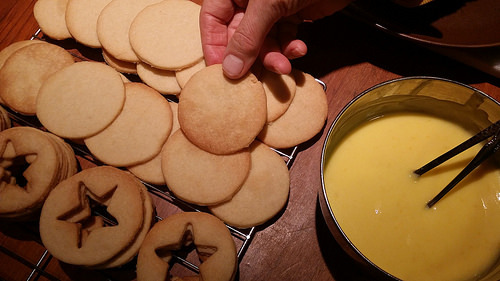 19 They can be stored in tins, although you do have to take care that the lemon curd is sufficiently solidified, and even then, I would recommend layering, if at all, with plastic wrap inbetween. This worked well with our cookies. They have become the "new favorite" of one of my sister-in-law's.